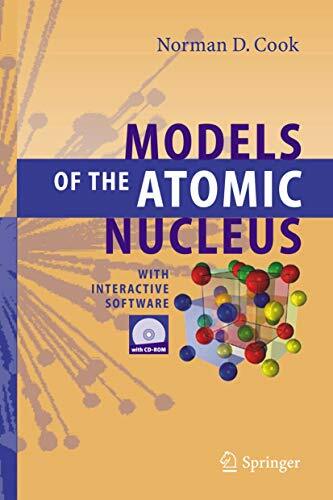 This book-and-CD-software package supplies users with an interactive experience for nuclear visualization via a computer-graphical interface, similar in principle to the molecular visualizations already available in chemistry. Models of the Atomic Nucleus, a largely non-technical introduction to nuclear theory, explains the nucleus in a way that makes nuclear physics as comprehensible as chemistry or cell biology. The book/software supplements virtually any of the current textbooks in nuclear physics by providing a means for 3D visual display of the diverse models of nuclear structure. For the first time, an easy-to-master software for scientific visualization of the nucleus makes this notoriously "non-visual" field become immediately ‘visible.’ After a review of the basics, the book explores and compares the competing models, and addresses how the lattice model best resolves remaining controversies. The appendix explains how to obtain the most from the software provided on the accompanying CD. This book supplies users with an interactive experience for nuclear visualization via a computer-graphical interface, similar in principle to the molecular visualizations already available in chemistry. Models of the Atomic Nucleus explains the nucleus in a way that makes nuclear physics as comprehensible as chemistry or cell biology. The book supplements virtually any of the current textbooks in nuclear physics by providing a means for 3D visual display of the diverse models of nuclear structure. After a review of the basics, the book explores and compares the competing models, and addresses how the lattice model best resolves remaining controversies. The appendix explains how to obtain the most from the software provided on extras.springer.com. This new edition has been updated completely and expanded to cover recent developments in low energy nuclear reactions (LENR), and to show how the fcc nucleon lattice explains both the asymmetric fragments produced by the fission of Uranium and the symmetric fragmens produced by the fission of Palladium.